For Bal Arneson, everything starts with spice. Whether it’s a surprise trip for the kids or creating a new recipe with an array of spices, with Bal there’s never a dull moment. On every episode, join Bal and her family on a one-of-a-kind adventure, and experience her fearless personality, unique cooking style and spice-inspired recipes. The Spice Goddess with Bal Arneson is a modern take on east Indian recipes that are inspired by village cooking in the Punjab. Each of these 13 episodes is an affirmation of what happens when you blend fresh wholesome ingredients with herbs and exotic spices. Having grown up in a traditional village where she learned to cook at a young age, Bal has many stories to tell about what she learned from her elders. At the heart of it all, Bal knows that creating tasty food is something any cook can achieve anywhere. 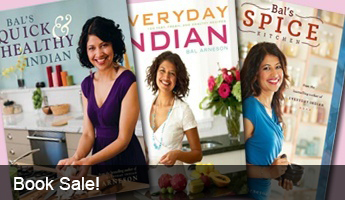 She will demonstrate simple techniques to enhance flavour and to make tantalizing Indian style dishes. Join Bal as she delves into the world of spices, to show how just a pinch of this and little bit of that can make everyday a day to celebrate eating.